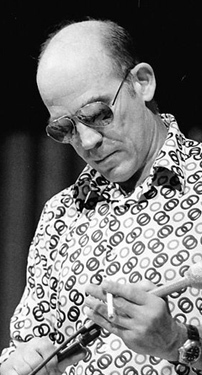 Hunter Stockton Thompson (July 18, 1937 – February 20, 2005) was an American journalist and author. He first came to popular attention with the publication of Hell's Angels: The Strange and Terrible Saga of the Outlaw Motorcycle Gangs (1966), although the work he remains best known for is Fear and Loathing in Las Vegas (1971), which was first serialized in Rolling Stone magazine. Thompson became a counter cultural figure as the creator of Gonzo journalism, an experimental style of reporting where reporters involve themselves in the action to such a degree that they become central figures of their stories. He had an inveterate hatred of Richard Nixon, who he claimed represented "that dark, venal, and incurably violent side of the American character" and who he characterized in what many consider to be his best book, Fear and Loathing on the Campaign Trail '72. He was known also for his lifelong use of alcohol and illegal drugs; his love of firearms and his iconoclastic contempt for authoritarianism. While suffering a bout of health problems, he committed suicide in 2005 at the age of 67.